The basic functional unit of a kidney is a nephron. The nephron consists of a filtering component known as the renal corpuscle and a renal tubule, which is responsible for absorption and secretion of ions. The renal tubule can be further divided into components known was the proximal convoluted tubule, the Loop of Henle and the distal convoluted tubule. This article will focus on the ion absorption which occurs in the proximal convoluted tubule. The proximal convoluted tubule (PCT) has a high capacity for reabsorption, hence it has specialised features to aid with this. It is lined with simple cuboidal epithelial cells which has a brush border, which increases surface area, on the apical side. Moreover, they also have a large number of channels on both the apical and basolateral membrane which provides a large surface area for transport of ions and other substances to occur. Additionally, the epithelial cells have large amounts of mitochondria present to support the processes involved in transporting ions and substances. The proximal tubule can be divided into pars convolute and pars recta. The pars convolute resides in the renal cortex and it can further be divided into 2 segments, the S1 and the proximal part of S2. The pars recta is a straight segment present in the outer medulla. It makes up the distal part of S2 and S3. Fig 1.0 – Histology of the nephron. 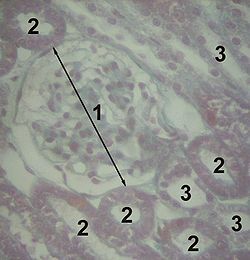 The following structures are shown: 1 (Glomerulus), 2(PCT) and 3(DCT). A large amount of reabsorption occurs in the PCT. Reabsorption is when water and solutes in the PCT are removed and moved back into the blood. In the PCT this process occurs via bulk transport. The solutes and water move from the PCT to the interstitium and then into peri-tubular capillaries. The reabsorption in the proximal tubule is isosmotic. In the PCT 65% of water, 100% of glucose, 100% amino acids, 65% of potassium, 65% chloride and 67% of sodium is reabsorbed. This reabsorption occurs due to the presence of channels on the basolateral (facing the interstitium) and apical (facing the lumen). The driving force for the reabsorption in the PCT is sodium, which is usually transported with other ions such as Cl- in order to maintain electro-neutrality. There are two routes through which reabsorption can take place: paracellular and transcellular. The transcellular route is transporting solutes through a cell. The paracellular route is transporting solutes via the intercellular space between cells. On the basolateral side of the cells in the PCT the 3Na-2K-ATPase pumps out intercellular Na+ ions. This transporter uses primary active transport. This movement of Na+ creates an electrochemical gradient favouring the movement of Na+ into the cell from the apical side. The 3Na-2K-ATPase is present in the S1, S2 and S3 segments of the PCT. The S1 segment of the PCT is not permeable to urea and Cl- ions, hence their concentration increases in S1 which creates a concentration gradient which can be utilised in the S2 and S3 segments. In the S2 and S3 segment Cl- ions can be transported from the lumen of the tubule into to the peritubular capillaries through paracellular (a passive process) and transcellular route down their concentration gradient. 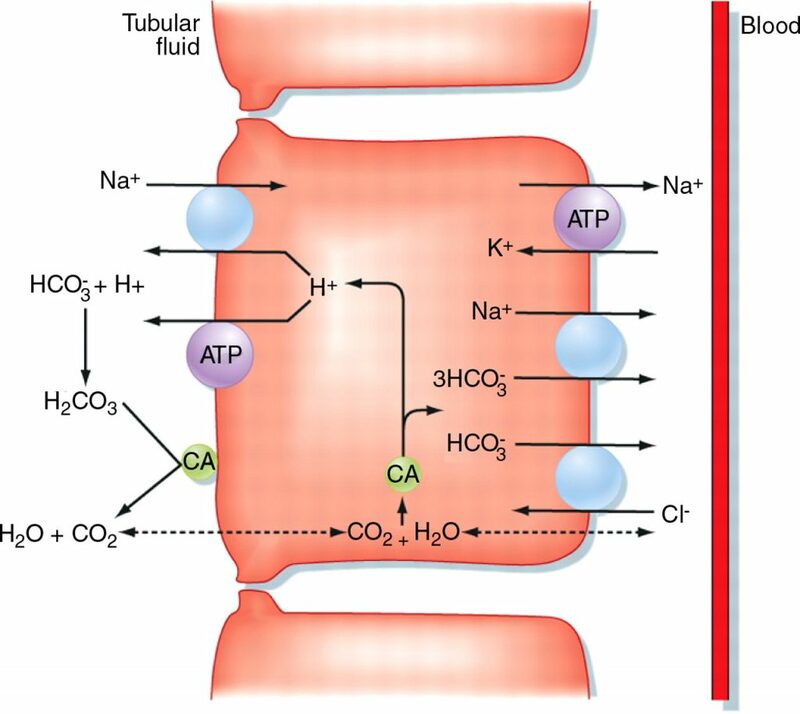 The sodium concentration gradient allows other molecules, such as glucose, to be transported across the apical membrane against their concentration by co-transport. SGLUT transporters move glucose, along with two sodium ions across the apical membrane. Glucose then crosses the basolateral membrane via facilitated diffusion. Na+/Amino acid symporters are present on the apical side of cells in the S1 segment of the PCT which reabsorbs all the amino acids in the PCT. Na+/H+ antiporter is another protein of the apical side of the cells in the PCT. It is an antiporter which is a core transporter that transports ions across a plasma membrane in opposite directions. In this case, the Na+ ions move into the tubular cells and the H+ is expelled into the tubule. The primary function of this transport it to maintain the pH. This antiporter is present on S1, S2 and S3 segments. In the PCT there are a large amount of solutes being transported out, this means that their concentrations in the tubule are decreasing and their concentrations in the interstitium are increasing. The difference in concentration gradient results in the water moving in the same direction as the solutes into the intertitium via osmosis. Water mainly takes the paracellular route to move out of the renal tubule but it can also take the transcellular route. Fig 2 – Diagram showing ion absorption and secretion within the proximal convoluted tubule. Secretion is when substances are removed from the blood and transported in the PCT. This is very useful as only 20% of the blood is filtered in the glomerulus every minute, so this provides an alternative route for substances, such as potassium or drugs, to move into the filtrate in the PCT. Secretion of organic cations such as dopamine or morphine occurs via the H+/OC+ exchanger on the apical side of the tubule cell which is driven by the Na+/H+ antiporter. The cations enter the cell on the basolateral side by a uniporter. Fig 3 – Histology of the kidney showing normal tissue on the left of the image and renal cell carcinoma on the right of the image. 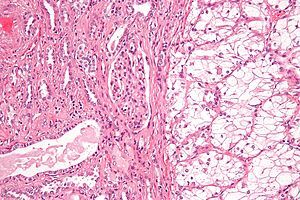 Renal cell carcinoma (RCC) is the most common primary renal malignancy which originates from the PCT. It has been related to alterations in chromosome 3 which can non-hereditary or hereditary. Most commonly it occurs in men between the ages of 50-70. Incidence of renal cell carcinoma has been linked with smoking and obesity. It can present clinically with haematuria, flank pain, fever and weight loss. It can invade in to the renal vein and then into the inferior vena cava. From here, it can metastasize hematogenously to lung and bones. RCC can also have paraneoplastic effects. Paraneoplastic effects occur as a result of humoral factors excreted by cancer cells or due to an immune response against the cancer not due to the presence of cancer cells. In RCC paraneoplastic effects are caused by release of ACTH or PTHrP. ATN can be caused by ischaemia which is usually occurs secondary to reduced renal blood flow (for example hypotension or sepsis). It can also be caused by nephrotoxic agents such as aminoglycosides and myoglobin. The ischaemia and toxins results in the death of tubular cells particularly the cells of the PCT. Symporter When glucose concentration exceeds the transport maximum, the extra glucose spills into the urine. Since glucose has an osmotic potential water follows the filtrate resulting in polyuria. Which type of epithelia is found in the PCT? Which ion channel generates an electrochemical gradient that is discharged for other ion channels? Where specifically are chloride ions reabsorbed the most? Which of these channels DO NOT utilise contransport in the PCT? Which of these statements is NOT true?